The Food and Drug Administration recently posted a guidance document on its web site captioned “Frequently Asked Questions About GRAS” (www.cfsan.fda.gov/~dms/grasguid.html). To the uninitiated, GRAS refers to “generally recognized as safe.” If a substance qualifies as GRAS when added to food in a particular application, there is no need to obtain any type of clearance or pre-market authorization from FDA before it is used. The GRAS concept is somewhat unique to U.S. food law. Our regulatory system for food additives is set up essentially as follows. As in most countries, “food additives” must be reviewed and cleared by government experts. In the U.S., the term “food additive” is defined to include anything that is reasonably expected to become a component of food when used as intended â€“ unless covered by an exception. 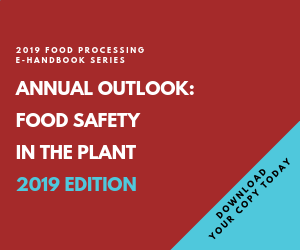 This establishes a very large and diverse set of things that are potentially food additives, including processing aids, substances that migrate into food from packaging, traditional food additives and even common food ingredients such as sugar and salt. The GRAS exception and other exceptions exist so FDA does not spend valuable resources reviewing and authorizing things that clearly are safe. The essential criteria for GRAS status are: 1. Qualified experts agree on the safety of the substance in the application(s) under consideration; and 2. The significant safety data or other information upon which this conclusion is based is publicly available. Alternatively, a substance may be deemed GRAS through experience based on common use in food prior to 1958. Some critics might feel the GRAS concept leaves too much discretion in the hands of the food industry. Why let the manufacturer of an additive declare it is acceptable from a regulatory standpoint and does not require FDA review? Anyone asking this question should consider that our current system for regulating substances added to food has not been characterized by safety problems. Furthermore, the food industry has a strong incentive to use additives and ingredients that are unquestionably safe. Despite the availability of the GRAS exception, many food manufacturers insist on using substances that have been cleared by FDA or that have been voluntarily notified to FDA as GRAS. In 1972, FDA established a program for the voluntary submission of GRAS Affirmation Petitions. In 1997, FDA introduced a streamlined process by which interested manufacturers may file a GRAS Notification seeking FDA’s review of a GRAS determination. GRAS Notifications typically include less detail than was required in a GRAS Affirmation Petition, and a favorable response from FDA is not a regulation, but is merely a letter stating the agency has no questions. Another misconception is that GRAS status is conferred, almost ceremonially, by a GRAS panel of qualified experts, and a substance that “has been GRASed” will always be GRAS. GRAS status exists for a particular substance in a particular application or set of applications as long as the relevant data point toward a favorable safety conclusion, and this is a matter of consensus among qualified experts. This can change if new information becomes available. It is not often that a substance becomes “no longer GRAS,” but one prominent example would be cyclamate salts. They lost their GRAS status as sweeteners in the U.S. around 1969 (but are still used and considered safe in other countries). The GRAS concept has possibly evolved a bit since it was first envisioned. Congress clearly wished to exempt things such as flour and table salt from regulation as “food additives.” Congress may not have envisioned that new ingredients would be introduced into the food supply as GRAS. Today, GRAS status seems to be the preferred regulatory path for the introduction of new food ingredients. This is because self-determined GRAS status, or favorable FDA review of a GRAS Notification, often can be accomplished in less time than is required for FDA to review a food additive petition and promulgate a responsive food additive regulation. Very few food additive petitions are filed today compared to the number of GRAS Notifications. FDA’s recent FAQ document does not announce new policy or break new ground, but it is a helpful review of some basic concepts surrounding GRAS status. Plus, it comes at a time when more new substances appear to be introduced as GRAS than as regulated food additives. David Joy is a partner at the Washington, D.C. law firm of Keller and Heckman LLP. He specializes in food and drug law, is a member of the District of Columbia Bar and holds a bachelor's degree in chemistry. For more information about Keller and Heckman, visit the firm's website at www.khlaw.com.